With all the typing and work most of us do on computers every day, writing with a pen becomes a special occasion. Make it even more so as you sign your name or write your story with these unique and beautifully made pens. The perfect gift for the person who �has everything�. 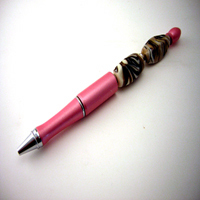 The beads on this pen are swirly gold and copper colour and bring out the quirky pink in the pen. A fun gift!